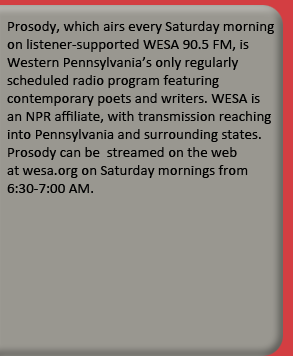 Prosody, which airs every Saturday morning on listener-supported WESA 90.5 FM, is Western Pennsylvania's only regularly scheduled radio program featuring contemporary poets and writers. WESA is an NPR affiliate, with transmission reaching into Pennsylvania and surrounding states. Prosody can be podcasted through ITunes or streamed on the web at wesa.org on Saturday mornings from 6:30-7:00 AM. Jan Beatty is the producer of Prosody. Beatty is the author of four books of poetry: The Switching/Yard (2013), Red Sugar (2008), Boneshaker (2002) and Mad River (1995), all published by the University of Pittsburgh Press. She has received the Agnes Lynch Starrett and Pablo Neruda Poetry Prizes, among other honors. Prosody co-host and co-producer Ellen Wadey has worked with the show since 2001. Staffers Michelle Stoner and Lisa Alexander are the program's engineers and editors. Laurin B. Wolf is a poetry co-host for Prosody. Now in its twenty-second year, Prosody was founded by writer Mary Radford. Poet John Schulman shared co-hosting duties with Mary for several years. In its early years on the air, Prosody featured only local writers - but as the program grew in stature, writers of national and international note began appearing. Guests have included U.S. Poet Laureates, Pulitzer Prize winners, National Book Award writers, and MacArthur Grant recipients. These include Robert Pinsky, Marilyn Hacker, Eavan Boland, Gerald Stern, Michelle Cliff, Sonia Sanchez, Sandra Cisneros, John D'Agata, Barry Lopez, Jean Valentine, Eve Ensler, Chuck Kinder, Nikki Giovanni, Marilyn Chin, Alicia Ostriker, Sekou Sundiata, Yusef Komunyakaa, Alice Notley, Dorianne Laux, Lewis Nordan, Lynn Emanuel, and Ed Ochester. Prosody's community partnerships include a Symposium on Women Writers of Color, funded by Pennsylvania Partners in the Arts and featuring the writers Toi Derricotte, Fiona Cheong, and Yona Harvey. This symposium included a roundtable discussion on issues of race and creativity. Local guests on Prosody are also showcased in print in Chapter&Verse, a feature of City Paper. WESA is grateful to the City Paper for their collaborative efforts. WESA is a listener-supported community radio station that relies on the generous and continuing support of station members whose contributions make Prosody, as well as all other programming, possible. Jan Beatty has hosted and produced Prosody, a public radio show on NPR affiliate WESA-FM featuring the work of national writers, for over twenty years. Her fourth full-length book, The Switching/Yard, was published by the University of Pittsburgh Press in 2013 and won the 2014 Paterson Award for Literary Excellence for Previous Finalists of The Paterson Poetry Prize. Library Journal named it one of ...30 New Books That Will Help You Rediscover Poetry. Beatty's poem, "Youngest Known Savior," from The Switching/Yard, was chosen for Best American Poetry 2013. In The Huffington Post, December 17, 2013, Beatty was named as one of ten women writers for "required reading." Her poem, "Shooter" was featured in a paper by the scholar Mary Kate Azcuy: "Jan Beatty's 'Shooter,' A Controversy For Feminist & Gender Politics." This paper, which also includes the work of gender theorists Judith Butler and Judith/Jack Halberstam, was presented at the FAAAM: Femmes Auteurs Anglo-Américaines Conference at the Université of Paris, Ouest Nanterre on June 14, 2013. Also in 2013, her project, "Ghostbaby" was named as one of 300 projects internationally that advanced to the second or third round in the highly competitive grants for Literature and Performing Arts by Creative Capital, and was featured on On Our Radar. "Ghostbaby" is a proposed poetry-based memoir exploring the cultural story of adoption. Other books include Red Sugar, finalist for the 2009 Paterson Poetry Prize; Boneshaker, finalist, Milton Kessler Award; Mad River, Agnes Lynch Starrett Prize - all published by the University of Pittsburgh Press. A limited edition chapbook, Ravage, was published by Lefty Blondie Press in 2012. Her chapbook, Ravenous, won the 1995 State Street Prize. Other awards include the $10,000 Regional Artists Grant from The Pittsburgh Foundation, the $15,000 Creative Achievement Award in Literature from the Pittsburgh Cultural Trust, the Pablo Neruda Prize for Poetry, Discovery/The Nation Prize finalist, and two fellowships from the Pennsylvania Council on the Arts. Individual poems have appeared in journals such as TriQuarterly, Gulf Coast, and Court Green. Her essays on writing have appeared in anthologies by Autumn House Press, Creative Nonfiction, and The State University of New York Press. She has read her work widely, at venues such as the Los Angeles Times Book Festival, the Geraldine R. Dodge Festival, Split This Rock Poetry Festival, Sarah Lawrence College, and the KGB Bar in New York City. Beatty has taught at the university level for over twenty years at the University of Pittsburgh, Carnegie Mellon University, and Carlow. She directs the creative writing program at Carlow University, where she runs the Madwomen in the Attic writing workshops and teaches in the MFA program. Michelle Stoner is the author of the full-length poetry collection Flats and Riots, (WordTech Communications, 2008). Her work has also appeared or is forthcoming in 5AM, Bloom, The Collared Peccary, and Weave Magazine, among others. She holds an MA in English from Indiana University of Pennsylvania and an MFA in Creative Writing, Poetry from Carlow University, where she teaches writing and women's studies. She also manages the Accelerate Leadership Center at Carnegie Mellon University. Lisa Alexander's poems have appeared or are forthcoming in various journals including Tupelo Quarterly, 2 Bridges Review, Pittsburgh Poetry Review, The Burnside Review, BLOOM, and 5 AM among others. She holds an MFA in poetry from Drew University, and is a longtime member of the Madwomen in the Attic writing workshops. She has been a sound engineer for Prosody since 2008. Laurin B. Wolf has an MFA from Kent State University and BA from the University of Pittsburgh in poetry writing. Her poems have appeared in PoetsArtists, Rune, Scholars & Rogues, PMS, Pittsburgh's City Paper, and Two Review. Her book reviews have appeared in Whiskey Island. She co-hosts the monthly reading series Mad Fridays. She teaches writing at Duquesne University in Pittsburgh, PA.